Feel free to bring drinks and munchies to share. Come one, come all, we will be dancing, drawing and singing in the New Year at Morning Star Studio! With Contra in the Ballroom and a wide mix of GREAT Dance music in Sunset Gallery...Swing, Lindy, Pop, Blues and Latin, we have something for every body. You will find it impossible to sit down!! But just in case you do, Stardust Lounge will be open for socializing. AND to REALLY mix it up, The Fairfield Life Drawing Group will be hosting a silk draped model for the evening in the Lounge! With Stardust’s piano ready to go and a vocal mic set up, if you’ve got rhythm and your in the mood, your at the right place at the right time for a creative fun filled evening that will enliven your senses and inspire your New Year! New Year's Eve Contra Dances will be taught and called by the fabulous Davey Bar-Shimon from North Carolina. Davey is a very talented caller who got his contra chops in Asheville, NC, a famous center of authentic American folk dance, music and arts. Think HOT contra music! Featuring tunes from well-known contra dance bands, such as: Wild Asparagus, the Elftones, Contratopia, Perpetual e-Motion, and Liz Knowles (superb fiddler, and member of the talented Celtic music group, Cherish the Ladies – who just played this month to a full house here at the Sondheim). While we won't have a band - the music for this dance will be recorded - never fear! Our November dance called by Davey and featuring selections from the above groups hit real peaks of Contra-bliss! New Year's Eve will be over the Contra-top! Contra Dance is a traditional communal style folk dance that is fun and easy to learn. No partner or experience is necessary. A caller leads the dancers though a series of moves, and the pattern repeats. If you can walk, you can contra dance! So come on out and share a joyful New Year's Eve with your Fairfield friends and family at Morning Star Studio. Bring your dancing shoes, your drawing supplies and your heartfelt New Year’s Intentions. Doors open at 8:30 pm. $5 at the door. Potluck; Feel free to bring drinks and munchies to share. 51 1/2 S. Court St. Fairfield, IA. The current Contra dance revival in Fairfield runs back about 20 years, first inspired by Frieda Gratzon and later, Jennifer Hamilton, who taught and inspired hundreds of dancers. Since Contra dance was a widely popular American dance form beginning in the late 1700's, surely its history in Fairfield goes back further than 20 years! 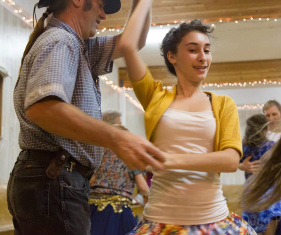 Contra dances are currently held once or more each month. See www.fairfolk.org for dates and times of other upcoming dances this winter and spring. Questions about the New Year's Eve Contra dance: Contact April at a.maberry.kpl@gmail.com .